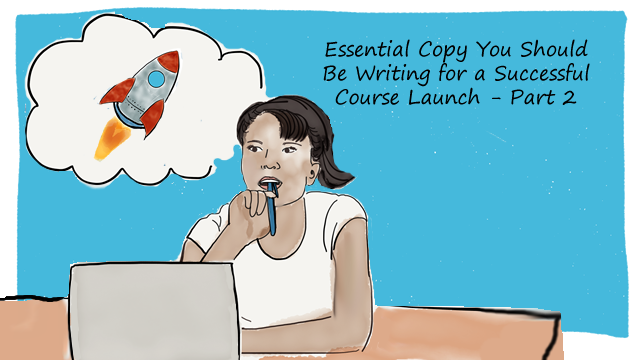 This post is Part 2 in a series dedicated to copywriting for your online course launch. If you missed Part 1, which outlined essential copy for launching with no audience, you can catch up here. If you want to launch an online course, having an email list at your fingertips should make everything easier. You put a message out there, hundreds or even thousands of people read it, and they take action. Lo and behold, you get your first sales within minutes! At least, that’s how it works in theory. 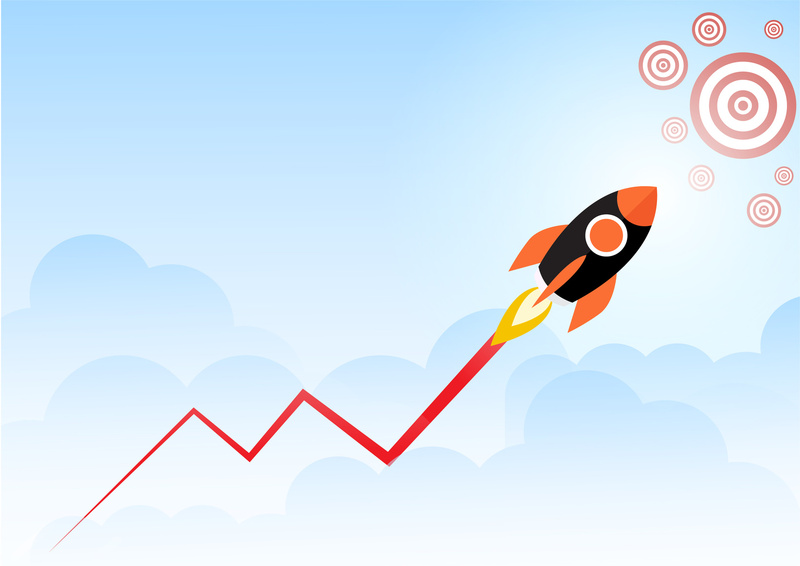 In practice, having an audience of any size, from a few hundred to hundreds of thousands, doesn’t automatically lead to a successful course launch. You have validated your course idea and know that people want it. In other words, you’re making the right offer. There are enough “ideal customers” in your audience, people who can and will pay you. If your list is made up mostly of freebie hunters, then you’ll have trouble getting traction in your launch. You present the offer at the right time, once your target audience is actively looking for the solution you want to offer (your course). Without those three things—the right offer, the right audience, and the right timing—your offer won’t stand a chance. You might as well just let your cat walk all over your keyboard, and launch with that. The result would be the same, maybe even better. I mean, who wouldn’t buy from a cute copywriting cat? She’s only slightly less clueless than your average freelance copywriter. But the good news is, you can accomplish all those objectives during your course launch by using the right copy to your advantage. Smart, strategic copy can help you validate your course idea, qualify or disqualify your subscribers based on how likely they are to buy, and cleverly put them “in the mood” for purchasing something exactly like your online course. In this post, we’re going to outline exactly which copy you need to make all of that possible, to ensure that your course launch goes as planned, instead of sputtering out like so many others. Talk to as many people in your target market as you can. Learn as much as possible about their problems and needs. Once you’re confident they’re a good fit, offer them to join your course. The difference is, you’ll be doing it at a slightly larger scale. Not as large as a 50,000-strong email list, for example, but substantial all the same. Never underestimate a small, engaged group of people! Offer your list free 15-minute coaching sessions, to help with one specific challenge that relates to your course topic. Strive to provide enough value to help them make progress on the issue, but not so much that their entire problem is solved forever. Take the time to connect with your audience and talk to them about the challenges they’re facing. Again, make sure that those are specific to your course topic. Answer people’s questions, ask your subscribers about their goals, and offer helpful advice whenever you can. 1 to 3 Coaching Call Emails. Offering a short, laser-focused coaching call on a topic related to your course is a great way to identify interested prospects and generate buzz for your upcoming launch. It also happens to be an excellent way to research what your audience wants! To create a successful coaching call campaign, you need a short email announcing the coaching call and giving people detailed information on how to book it… with, you guessed it, a booking page! Here’s a sample script of what a coaching call email might look like, taken from inside our Course Builder’s Laboratory program. Then you’ll need to send an email reminder to follow on the heels of your initial message. And finally, you send one last email as a quick heads-up an hour or two before the call. This last email is entirely optional, though. 1 to 3 Helping Conversation Starters. Helping conversations are yet another terrific strategy for research and marketing. They’re authentic, they don’t cost you anything, and they build iron-clad relationships with your subscribers. Structure it as a campaign. First, send a short email with a question that you’d love to know the answer to. Maybe it’s about your audience’s #1 struggle with something. Maybe it’s what they would do if they had a certain opportunity (extra $10,000 in the bank, perfect physique, etc.). Have fun with it, and be playful! 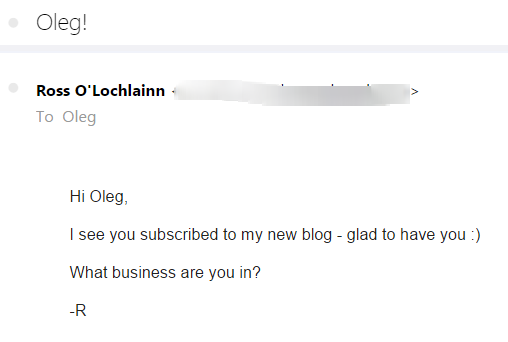 Here’s a great example of a helpful conversation starter from our Director of Growth, Ross O’Lochlainn. This email is brilliant. It’s designed to look like something a real person would send. 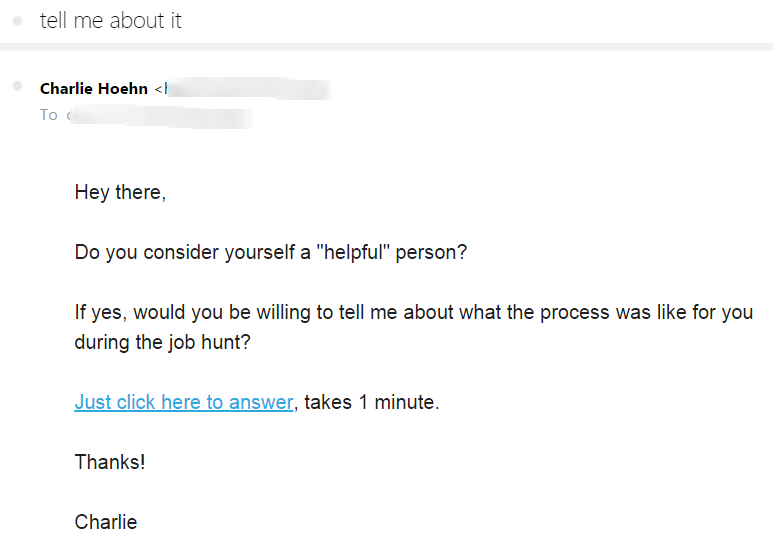 I knew it was an autoresponder, but it was done so well that I still replied. Remember: this isn’t a survey. This first email is merely an ice-breaker. And when you get a response, all you need to do is follow up with that person and get on a chat with them (either in-person or by phone, Skype, or video conferencing). Ask them more questions. Tell a joke. Help them with something they’ve been struggling with. Then, rinse and repeat until you’ve talked to 30 to 50 people in your target audience. By the end, you’ll have lots of authentic, meaningful interactions with your subscribers, plenty of insights into what they want, and some powerful marketing materials to use in future campaigns. Run a webinar and make the offer at the end. Then, sell again with a follow-up email sequence. Manually follow up with every interested prospect and make the offer (if you did your research). If you’ve never done a webinar before, I recommend treating this course launch as if you didn’t have an audience. Follow the copywriting guidelines described in Part One of this series. 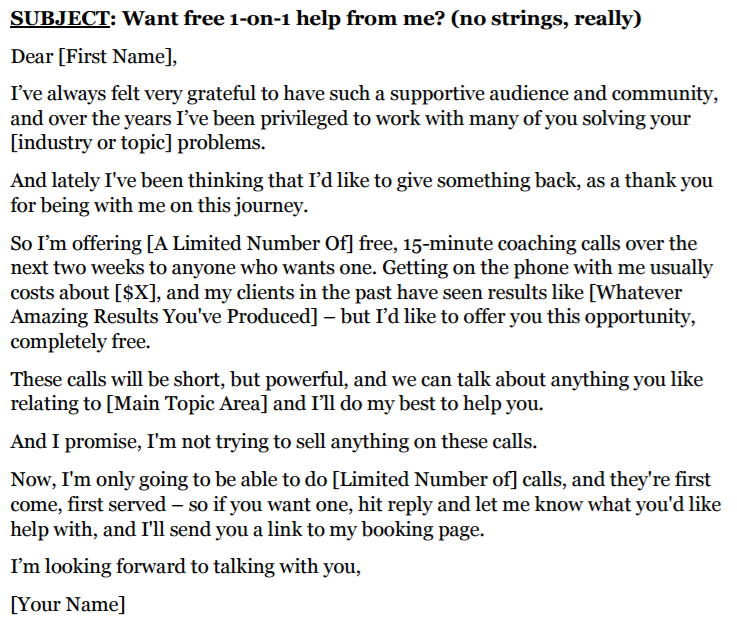 Contact everyone with whom you did a coaching call or a helping conversation, and use the process from the no-audience scenario to get on a call with them and pitch your course. If you’ve had previous experience with webinars, more power to you! Here’s the copy you’ll need to pull off your course launch. Detailed Webinar Script. If you decide to do a webinar, you need to invest a significant amount of time and effort in it. Budget at least 20 hours to create the webinar, and do a dry run with someone, to get practice and constructive feedback. You tell the story of how your audience can go from where they are to where they want to be. It could be your story or someone else’s. You teach people how to achieve an outcome they care about. Needless to say, it should be directly related to the topic of your online course. Re-open the gap. Remind the audience that what you taught them isn’t the whole picture. Invite them to join your course so they can achieve the result they care about as fast as possible. Pre-webinar Sequence (5 emails). To do a successful webinar launch, you need to make sure that enough people show up. A good pre-webinar sequence is designed to make sure of that. Announce the event 5 days in advance. All those coaching calls and helping conversations you’ve done probably gave you a great idea for a webinar. This is when you introduce the topic of the event, and invite people to attend. Send a reminder email 3 days before the webinar. Focus on the benefits you will deliver, and showcase 1-3 breakthroughs from your coaching calls if you can. The day before the webinar, send a preview email, giving people a teaser of what you will be covering, and reminding them to mark their calendars. On the day of the webinar, send 2 urgency-focused emails, inviting everyone to attend: first one in the morning, and another an hour before you go live. Optionally, you can send another email right after you go live, to get any last-minute stragglers to show up. Your webinar registration page doesn’t have to be fancy. Make sure to have a headline, the bulleted list of benefits, time and date, a call to action, and your beautiful self. Immediately after the webinar, send a thank-you email, and let everyone know when the replay goes up (if you’re doing a replay). The day after the webinar, send your audience a replay email. It’s optional, but highly recommended. Later that day, send a recap email summarizing the details of your online course, and invite people to join. Two days after the webinar, send an email that addresses frequently asked questions about the course. Try to address every unspoken objection or concern in this message. Three days after the webinar, send two last-call emails: one in the morning and one in the evening. 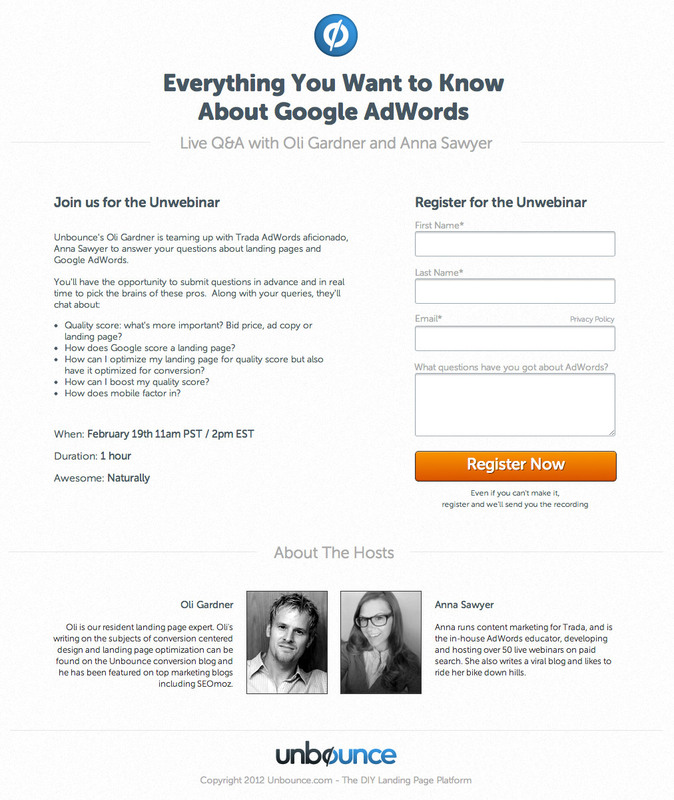 Webinar Replay Page. If you are posting the replay of the webinar for everyone who’s interested, you should ask people to join your course right there on the page with the recording. A big and obvious call to action–a Buy button–that links to the checkout page should do the trick. Simple Checkout Page. When you sell a course to a small audience, your first instinct may be to write one of those “grown-up” sales pages for people to read. You know, the ones that are 10,000 words long. Instead, I recommend that you stick with a simple checkout page. When selling through a webinar, a checkout page can actually outperform a full-blown sales page. Since you do most of the selling live on the webinar, a sales page can slow people down rather than boost your sales. We recommend the following strategies only if you have a list of 2,000 people or more. Certain things are only useful when you can implement them at scale. For an online business, that means reaching the milestone of 2,000 email subscribers. That’s when things like running a survey, creating pre-launch content, and writing a persuasive sales page become more than just exercises in vanity. In short, 2,000 is the “magic number” when all those tactics done by big-name online entrepreneurs start to make sense. With an engaged audience of 2,000 subscribers or more, validating your course idea is a matter of running one survey. Note that you still can– and should–engage with people individually to get deeper into their heads and uncover lots of useful problem language. But if your goal is simply to determine whether to pursue your online course idea, a well-designed survey campaign will suffice. Now, let’s talk about what exactly that means, and what Stage One copy you need to make your survey work. Survey Copy. Before you set out to design your first survey, there’s something you should know: Nobody likes surveys (except for Canadians, who crashed a government website on Census Day in 2016). They have to be brief (5 questions or less). They have to be specific. Requirement #1 is self-explanatory. Keep the survey as short and simple as possible. As for #2, let me explain it in more detail. Whenever possible, you want your subscribers to give you specific facts from their lives, as opposed to answering multiple-choice questions. “How much money per month would you like to be making as a freelance writer by this time next year? For starters, this question is leading, i.e. the way it’s designed favors one answer above all others. I mean, who wouldn’t like to make over $10,000 per month next year? It’s also inaccurate and based on the assumption that all freelance writers know exactly what their goals are and how to get there. Here’s how you could make it better. This open-ended question will give you tons of useful information that describe what your audience wants, but doesn’t try to measure it or generalize it. What do you need to do to successfully achieve this milestone? Please be specific (what, how, by when, etc.). If you’re not sure, tell me what you THINK you should do. If you could have direct access to me for one day, what could I do to help you in achieving this milestone? Besides [your website], who do you turn to for advice about [topic]? Have there been other products that you’ve found helpful? Survey Email Campaign. Generally speaking, there are two ways to invite people to take your survey. I can also tell that Charlie read Robert Cialdini’s new book, Pre-suasion. He used one of the framing strategies from the book to make me more likely to respond (note the first question). Why did I mention this? Because I’m a geek, and I couldn’t resist. Note that he says how long the survey will take and also mentions the benefit to me as a subscriber: if I fill this out, I’ll help him create better material for me. 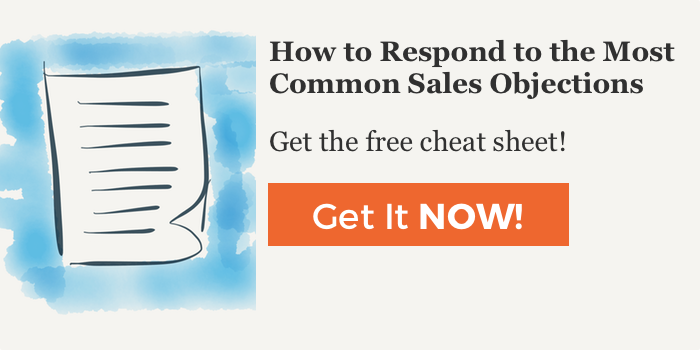 You may need to send more than one email to collect enough responses from your subscribers. And when I say “enough responses,” I mean at least 50 detailed and specific answers to each survey question. The more you get, the better. After you analyze the survey results and validate your course idea, it’s time for Stage Two–selling! Put your subscribers in the mood or the right frame of mind for something like your course. About 75% of your marketing campaign should be focused on creating the desire for your online course: by talking to your subscribers about their problem, bringing it to their attention, and describing to them what a solution would look like. Once they know they want it, offer your course to them. That’s what the remaining 25% is all about: talking about how their life will change after taking your course, why it will work for them, and what they need to do to get it. You will notice that the copy we’re focusing on in Stage Two will follow this pattern. Let’s discuss it in a bit more detail…. Sales Email Sequence. A good email sequence takes your subscribers on a journey. It’s designed to get them thinking about the problem that your online course will address and powerfully position it as the best solution for them. Email #1 alerts your subscribers to something they want to change in their lives… but don’t know they could. For example, if your online course teaches salary negotiation, Email #1 could tell a story about how you took your family on a dream vacation to Spain–all because you negotiated a $20,000 raise that made it all possible. Then, to get the conversation going, you could ask your audience: how would their lives change if their paycheck got $20,000 bigger? In response, you tell them how anybody can negotiate their salary, regardless of seniority, work experience, or any other excuses. Then you share a valuable piece of content–a PDF, a training video, or an ultimate guide– that shows them what the steps are. Email #3 talks about the problem (not being paid enough) some more. It talks about why people don’t negotiate or the common mistakes they make that make them fail miserably. You share some valuable advice on avoiding those mistakes. Then, you set up a solution: what if your subscribers knew exactly what to say, how to act, and how to respond during a salary negotiation? What if they had access to word-for-word scripts and training that had been proven to work? 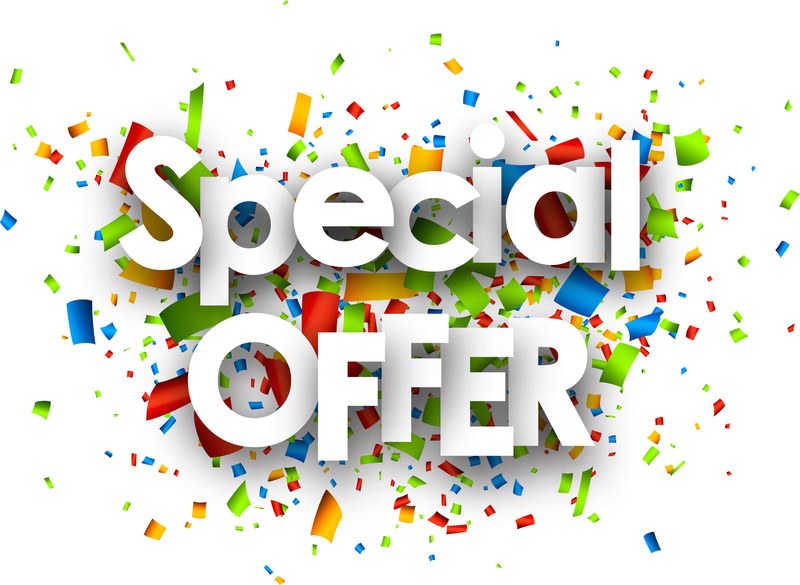 You announce your course and, for the first time, invite people to buy. In Email #4, you look at possible objections against buying your course, and demolish them one by one. Good ways of doing this include Frequently Asked Questions and case studies of successful students. Then you make the offer again, this time by emphasizing that there’s literally no good reason not to join your course! Finally, Email #5 drives the offer home in one of several ways. You could remind your audience about the cost of doing nothing, i.e., tell them that next year they’ll be making the same amount, or their raise will be a token 5 percent—if they’re lucky. You could describe to them again what life will be like after they have gone through your course–how they can use your material, again and again, to make more money at any job. You could also remind them about the money-back guarantee you have in place, and how even a modest salary bump will pay for the course several times over. Tell them that the doors on your offer are closing soon, and invite them to join. Simple Sales Page. Think of your sales page as a conversation with your potential student, captured on paper (or, in this case, on a web page). It’s not just a description of your course. It’s a dynamic narrative that anticipates what your buyer is thinking and communicates it. Your headline and sub-headlines. These are the big ideas and promises you want to reveal to your target audience right away, as soon as they set eyes on your sales page. Your sales argument. Things that speak to your customer’s “before” state or get them excited about their “after” state. For example, if you sell a fitness course that helps skinny men get bigger, it could be a story of either your own transformation or someone else’s. The summary of your offer. What it is, who it’s for, and how much it costs. When your sales narrative describes the problem your audience is facing and sets up the perfect solution, that’s when you transition into the offer itself. A call to action. 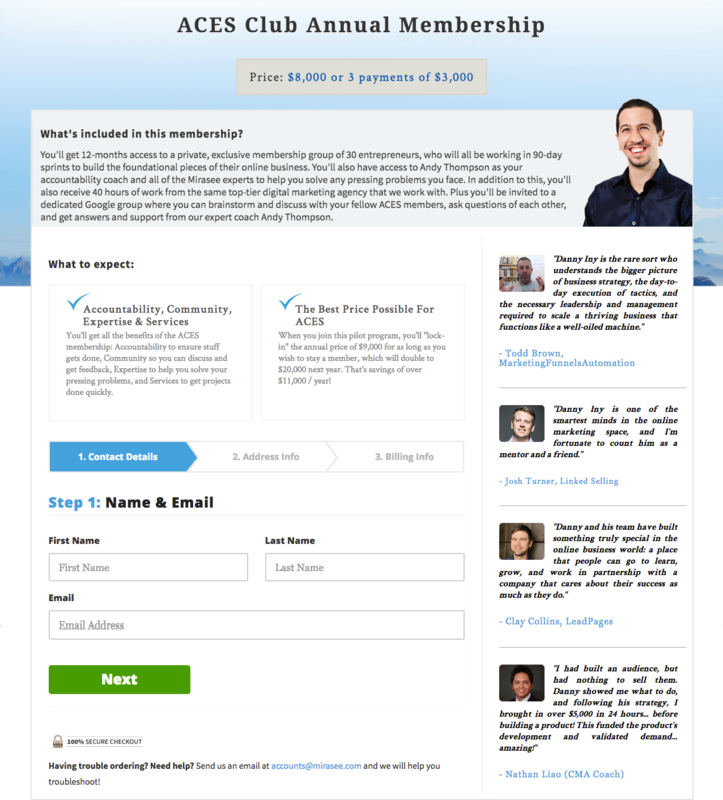 Phrases, buttons, and links you’re using to get people to join your course. There aren’t many hard-and-fast rules about how to write a persuasive sales page, and diving deeper into the subject goes way beyond the scope of this post. But if you’d like a good primer, you can check out this post by Neville Medhora. Note: Depending on which payment method you use, you may want to write simple checkout page copy to go with your sales page. I’ve discussed how to do that in the “small audience” part of this post (see above). As you can see, selling your online course with a pre-existing audience isn’t that much different than doing it with no audience whatsoever. There’s more work upfront, because there’s a lot more copy to write, but the fundamental principles are the same. Validate your idea before selling it, spend most of the time priming and pre-qualifying your subscribers to make sure that they want to buy from you, be ready to tackle objections along the way, and you’ll be well on your way to a successful course launch! In the meantime, which of these pieces of copy do you find most challenging to write? What are your biggest launch copywriting roadblocks? Let me know and I’ll give you my best tips to overcome them! You have arises exciting and interesting facts in your post, I am totally agree with your whole points and they really sounds effective to maximize our productivity level. These amazing facts are really sounds enough for maximize productivity and traffic to our website. We should always keep in mind while developing a successful course that it must be problem solving in nature as in simple way. Exactly, you have shared amazing strategies for huge and small group of audience and i like it most. Eventually, thanks for sharing your ideology in brief regarding this subject. Also, if I can’t help them, I will tell them. I recently did a 15-minute call with a lady and it became immediately apparent her issue (a long-standing conflict with her ex-husband that even professional mediation didn’t solve) was so deep-seated there was nothing I could do for her in 15 min. I felt like a failure, and ended up spending an hour on the phone listening to her. Setting boundaries and having her submit 1-2 questions in advance by email would have left both us feeling more satisfied. Maynot of gone as you imagined it would be, but sounds like you learnt loads from offering your free 15 mins session!